Our premium CBD Syrup is concentrated with valuable health benefits, which may include anxiety relief, pain reduction, mood management and sleep support. 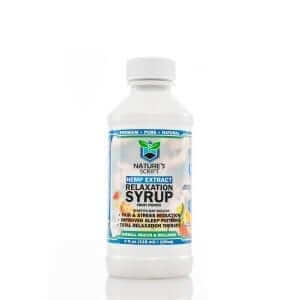 Nature’s Script CBD Syrup also includes extracts from other natural botanicals to help create a lasting sense of relaxation. You can personalize your Hemp Extract, or CBD, dose by measuring out your syrup to your liking. Whether you take our syrup on its own or mix it with your favorite drink, you’ll enjoy the light fruit punch flavor without a medicinal aftertaste. Like all Nature’s Script products, the CBD in our Syrup is derived from superior quality, organic Industrial Hemp.